Vertebral body erosion has been rarely reported in the literature. 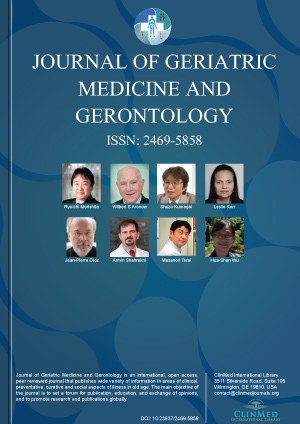 We present two geriatric patients with chronic back pain who has vertebral erosion associated with aortic aneurysm, accompanied with literature review. Vertebral body erosion is a rare vertebral pathology and often detected incidentally. Our aim is to present two geriatric patients with chronic back pain who has vertebral erosion associated with aortic aneurysm. 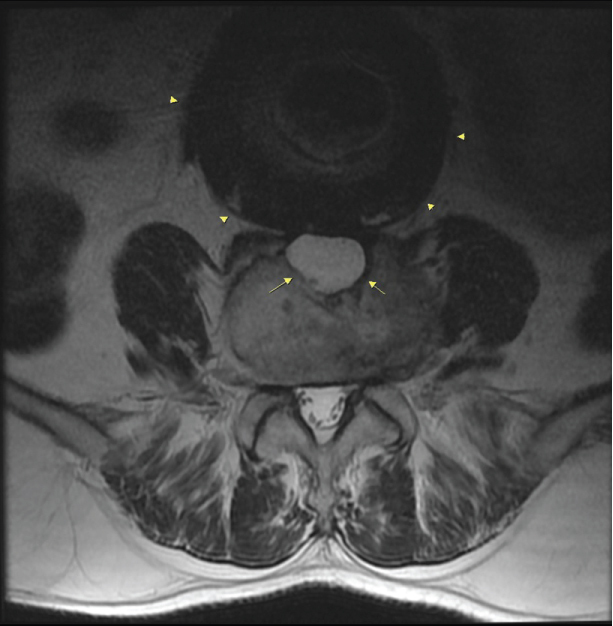 Case 1: A 71-year-old man with low back pain for more than a year, cortical erosion and vertebral cyst formation of L4 vertebral body were diagnosed on lumbar MRI. There was no compression fracture or bone marrow edema. 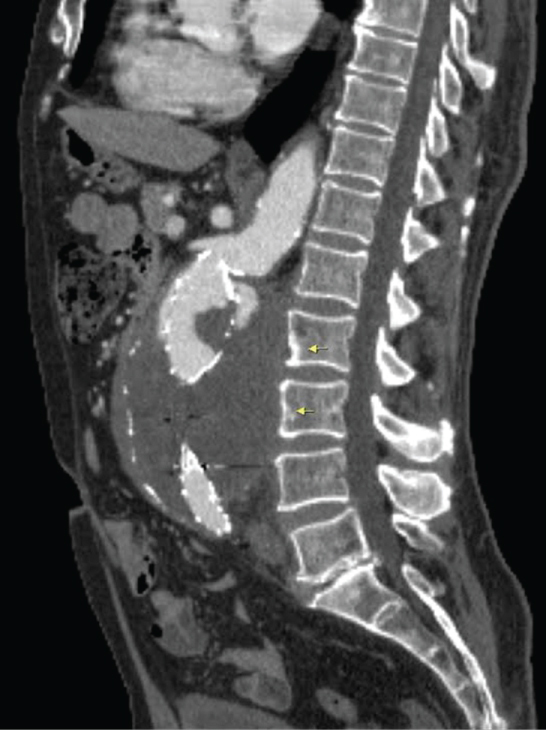 The fusiform unruptured aneurysmatic dilatation of abdominal aorta was seen adjacent to the vertebral cyst (Figure 1 and Figure 2). 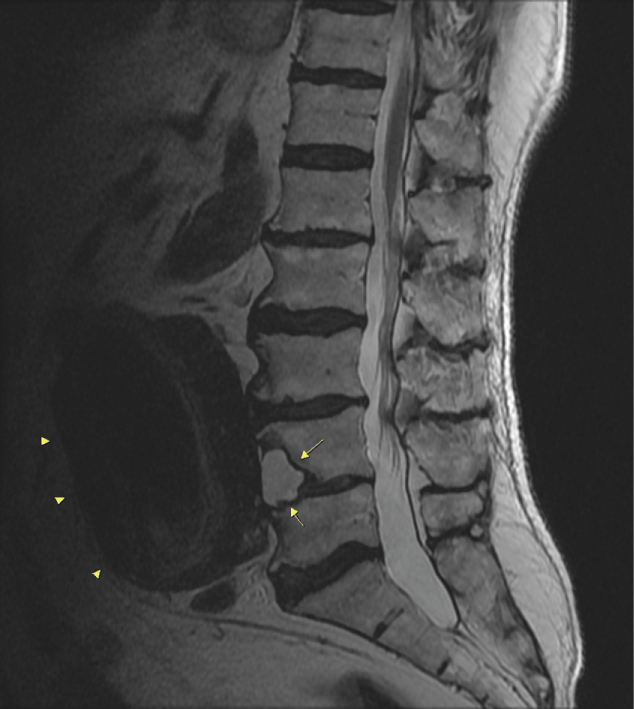 The vertebral cyst was thought to be associated with abdominal aortic aneurysm (AAA). The aortic wall defect or paraaortic hematoma was not established. After the diagnosis of AAA associated with vertebral cyst, the patient was referred to cardiovascular surgery. Case 2: A 80-year-old man was under follow up assessments due to deteriorated general health status after the failed operation for AAA. The chronic contained ruptured aortic aneurysm (CCAA) and erosion at the anterior corpus of the adjacent vertebra were established with CT (Figure 3 and Figure 4). Vertebral erosion is generally associated with tumor or infection. Aortic aneurysm also rarely causes vertebral erosion. In the systematic review of Pubmed and Google scholar for vertebral erosion associated with aortic aneurysm, we have found that total of 32 cases by since 2000 (Table 1). This corresponds approximately to two cases per year. Among aortic aneurysms causing vertebral erosion, the most commonly defined type is chronic contained ruptured abdominal aortic aneurysm (CCAA), it has irregular posterior aortic wall and chronic stage hematoma with frequently associated with vertebral erosion . Vertebral erosion is caused by the mass and pulsation effect of aneurysm and retroperitoneal hematoma can also lead to vertebral erosion . Because of high risk of rupture, CCAA necessities surgical intervention. Vertebral erosion associated with aneurysm may cause low back pain. For this reason, there is a risk of misdiagnosis and hazard of delayed diagnosis. In the literature, 16 CCAA [2-17], 7 aortic aneurysms [18-21] and 1 pseudoaneurysm  were defined. Vertebral erosions associated with false aneurysm at prosthetic graft junction in three patients [22,23], and one patient with widespread vertebral lysis associated with Coxiella burnetti infection related with vascular surgery was also reported in the literature . Furthermore, vertebral erosion associated with aortic aneurysms occurred in the course of Behçet's disease were present [25-28]. The most commonly affected vertebra is third lumbar vertebra (L3) and L4, L2, L1 vertebra in descending order. Vertebral body erosion is a rare pathology in geriatric patient with back pain, associated with aneurysm and infections. Thanks to Berrin Erok for English writing assistance. The part of manuscript was presented in Turkrad 2016. Benny BV, Nagpal AS, Singh P, Smuck M (2011) Vascular causes of radiculopathy: A literature review. Spine J 11: 73-85. Caynak B, Onan B, Sanisoglu I, Akpinar B (2008) Vertebral erosion due to chronic contained rupture of an abdominal aortic aneurysm. J Vasc Surg 48: 1342. Saiki M, Urata Y, Katoh I, Hamasaki T (2006) Chronic contained rupture of an abdominal aortic aneurysm with vertebral erosion: Report of a case. Ann Thorac Cardiovasc Surg 12: 300-302. Arici V, Rossi M, Bozzani A, Moia A, Odero A (2012) Massive vertebral destruction associated with chronic rupture of infrarenal aortic aneurysm: Case report and systematic review of the literature in the English language. Spine (Phila Pa 1976) 37: E1665-E1671. Aydogan M, Karatoprak O, Mirzanli C, Ozturk C, Tezer M, et al. (2008) Severe erosion of lumbar vertebral body because of a chronic ruptured abdominal aortic aneurysm. Spine J 8: 394-396. Bansal M, Bansal M, Thukral BB, Malik A (2006) Contained rupture of a thoracoabdominal aortic aneurysm presenting as a back mass. J Thorac Imaging 21: 219-221. Lai CC, Tan CK, Chu TW, Ding LW (2008) Chronic contained rupture of an abdominal aortic aneurysm with vertebral erosion. CMAJ 178: 995-996. Lombardi AF, Cardoso FN, Fernandes AR (2016) Extensive erosion of vertebral bodies due to a chronic contained rutured Abdominal aortic aneurysm. J Radiol Case Rep 10: 27-34. Kapoor V, Kanal E, Fukui MB (2001) Vertebral mass resulting from a chronic-contained rupture of an abdominal aortic aneurysm repair graft. AJNR Am J Neuroradiol 22: 1775-1777. Erdogan A, Gilgil E, Demircan A (2005) Vertebral erosion resulting from a chronic retroperitoneal rupture of an Abdominal aortic aneurysm. EJVES Extra 9: 113-115. Gandini R, Chiocchi M, Maresca L, Pipitone V, Messina M, et al. (2008) Chronic contained rupture of an abdominal aortic aneurysm: From diagnosis to endovascular resolution. Cardiovascular Intervent Radiol 31: S62-S66. 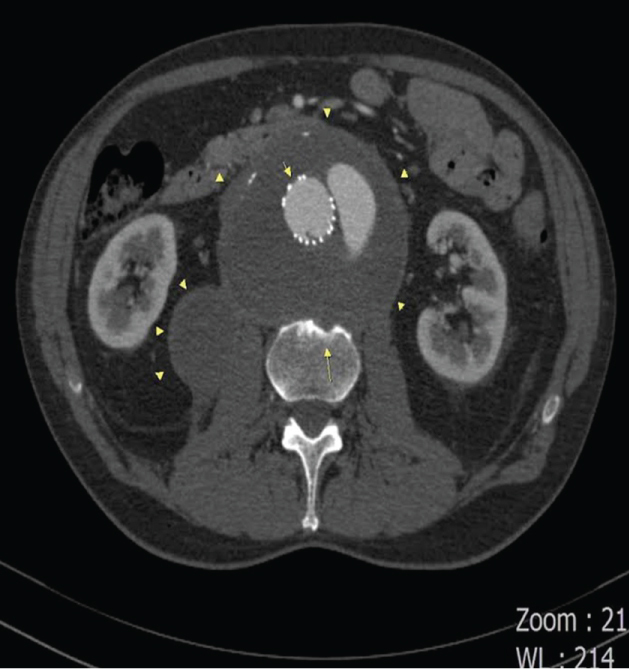 Nakano S, Okauchi K, Tsushima Y (2014) Chronic contained rupture of abdominal aortic aneurysm (CCR-AAA) with massive vertebral bone erosion: Computed tomography (CT), magnetic resonance imaging (MRI) and fluorine-18-fluorodeoxyglucose positron emission tomography (FDG-PET) findings. Jpn J Radiol 32: 109-112. Matsunaga I, Nogami, E, Higuchi S, Okazaki Y, Itou T (2015) Chronic contained rupture of aortic aneurysm witk thorasic vertebral erosion. Asian Cardiovascular and Thorasic Annals 23: 564-566. Yuksekkaya R, Koner AE, Celikyay F, Beyhan M, Almus F, et al. (2013) Multidetector computed tomography angiography findings of chronic-contained thoracoabdominal aortic aneurysm rupture with severe thoracal vertebral body erosion. Case Rep Radiol 2013. Alshafei A, Kamal D (2015) Chronic contained abdominal aortic aneurysm rupture mimicking vertebral spondylodiscitis: A case report. Ann Vasc Dis 8: 113-115. Sakai T, Katoh S, Sairyo K, Higashino K, Hirohasm N, et al. (2007) Extension of contained rupture of an abdominal aortic aneurysm into a lumbar intervertebral disc. Case report. J Neurosurg Spine 7: 221-226. Jukovic M, Kokovic T, Nikolic D, Ilic D, Till V (2016) Lower back pain-silent symptom of chronic infrarenal abdominal aneurysm rupture. Med Pregl 69: 115-117. Takahashi Y, Sasaki Y, Shibata T, Suehiro S (2007) Descending thoracic aortic aneurysm complicated with severe vertebral erosion. Eur J Cardiothorac Surg 31: 941-943. Gonzalez Gay M, Alonso Perez M, Adeba Vallina E (2012) Vertebral erosions in abdominal aortic aneurysms as a cause of chronic low back pain. A series of 5 cases. Rev Esp Cir Ortop Traumatol 56: 478-481. Farhan-Alanie OM, Ahmed Z, Stuart W (2012) Vertebral erosion resulting from a 'non-ruptured' abdominal aortic aneurysm: Case report and literature review. Scott Med J 57: 182. Jang JH, Kim HS, Kim SW (2008) Severe vertebral erosion by huge symptomatic pulsating aortic aneurysm. J Korean Neurosurg Soc 43: 117-118. Diekerhof CH, Reedt Dortland RW, Oner FC, Verbout AJ (2002) Severe erosion of lumbar vertebral body because of abdominal aortic false aneurysm: Report of two cases. Spine (Phila Pa 1976) 27: E382-E384. Mancini F, Ascoli-Marchetti A, Garro L, Caterini R (2014) Aseptic lysis L2-L3 as complication of abdominal aortic aneurysm repair. J Orthop Traumatol 15: 291-294. O'Donnell ME, Manshani N, McCaughey C, Soong C, Lee B (2007) Coxiella burnetii infection of an aortic graft with multiple vertebral body erosion. J Vasc Surg 45: 399-403. El Maghraoui A, Tabache F, El Khattabi A, Bezza A, Abouzahir A, et al. (2001) Abdominal aortic aneurysm with lumbar vertebral erosion in Behçet's disease revealed by low back pain: A case report and review of the literature. Rheumatology (Oxford) 40: 472-473. Örücü M, Keleş D, Peker E, Çakıcı M, Shimbori N, et al. (2015) Abdominal aortic aneurysm causing lumbar vertebral erosion in Behçet's disease presenting by low back pain. Rheumatol Int 35: 367-370. Barosu M, Lozano F, Almazán A, Arias R (2004) Angio-Behçet with vertebral erosion: An exceptional Behçet's complication and literature review. Joint Bone Spine 71: 577-579. Ahn HJ, Kwon SH, Park HC (2010) Abdominal aortic aneurysm rupture with vertebral erosion presenting with severe refractory back pain in Behçet's disease. Ann Vasc Surg 24: 254. Elif Evrim EKİN, MD, Radiology, GOP Taksim Training and Research Hospital, İstanbul, Turkey, Tel: +90-5323763069. © 2018 EKİN EE, et al. This is an open-access article distributed under the terms of the Creative Commons Attribution License, which permits unrestricted use, distribution, and reproduction in any medium, provided the original author and source are credited.